Diamond-infused bits are a most commonly used equipment for making holes or openings, of 0.75mm to up to 1500mm diameter, in concrete, stone and masonry structures. Diamond drilling equipment can obtain a depth of up to 5meter. In comparison to other primitive methods like bursting, diamond drilling is more precise and cost-effective method. The technique doesn’t require reinstatement work once drilling or cutting is executed. Unlike the traditional drilling methods, diamond drilling produces minimal dust and noise during the drilling operation. Thanks to the peerless hardness of industrial-grade diamonds, diamond drills can grind away any kind of surface easily and efficiently. These drills can also cut through steel, rebar and other hard materials which may not be possible using other abrasives. Diamond drilling technique ensures faster drilling at nano or micro level yielding smooth and clean surface. Moreover, diamond drills are available in a huge assortment of sizes, so you are sure to find one right fit for every drilling project you may have. From floor sawing, wire sawing and drilling to crushing, diamond drilling equipment can be used for a wide range of tasks that are common to the construction industry. 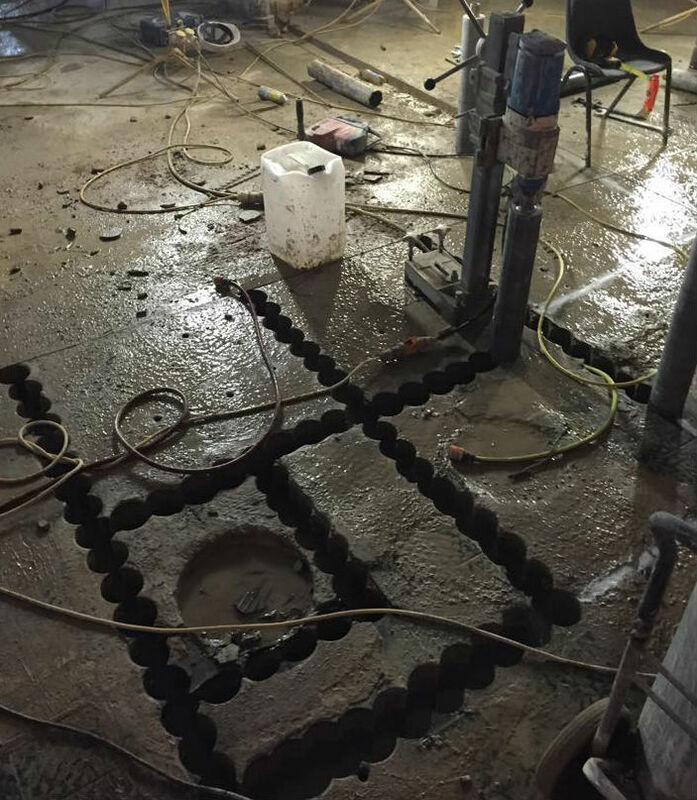 Drilling is performed to create openings for the installation of plumbing pipes, electric wires and to insert support frames during construction. Diamond drilling is also used to create space for window and door units in the walls. The drilling machines are also used in more challenging projects like demolition, property restoration and underground construction. Diamonds infused bits are fixed on the rotating end of drilling equipment, which is mostly powered by the hydraulic or electric system. Here drilling end of the equipment can move horizontal, vertical and inverted manner making it suitable for restricted space sites. Diamond stitch drilling is commonly used by contractors to create a series of neighbouring holes in any pattern required. The drilling method is also used to remove large sections of concrete slabs, walls or structures keeping the structural integrity of associated area intact. 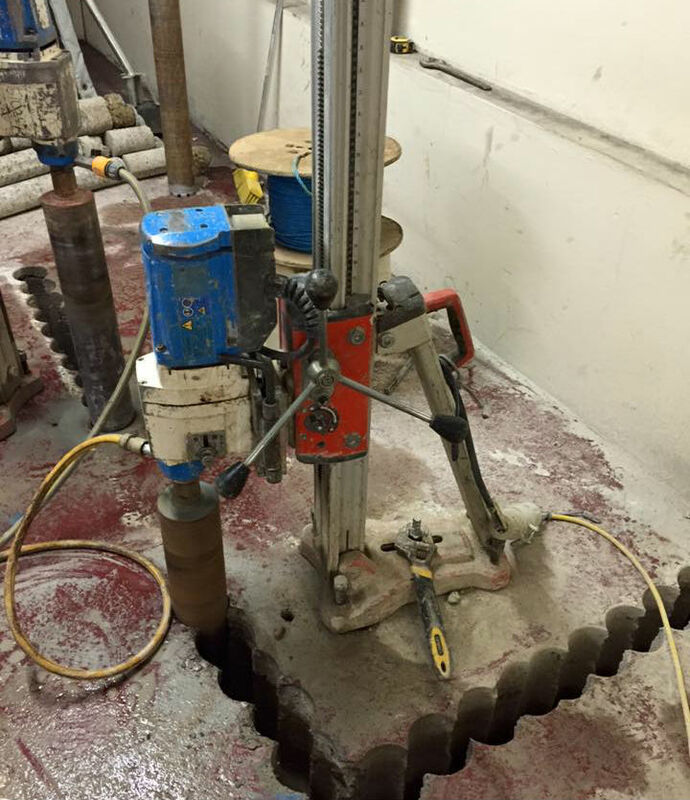 Whether it is a removal of crane base, making openings for life shaft or creating holes for pile caps, diamond drilling is the best technique to any complex drilling and cutting need you may have. Whether your purpose is to remove the damaged part of the structure or to create an opening channel for the insertion of utility pipes, diamond drills are the best choice. Regardless of the hardness or depth of concrete, diamond drills can efficiently cut through any piece of construction material leaving the sharp edge and smooth surface behind. The process of diamond drilling involves site survey, diamond blade selection, advance planning and safety management. Want to drill into concrete, stone or masonry structure? We’re here to help you!